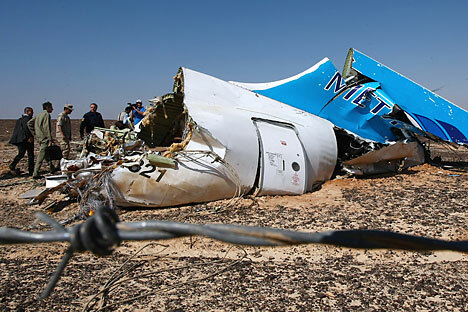 Wreckage of Russian MetroJet Airbus A321 at the site of the crash in Sinai, Egypt. RBTH presents a selection of views from leading Russian media on international events, featuring reports on the ongoing investigation into the Russian plane crash on Egypt’s Sinai Peninsula and plans by the Pentagon to develop a new strategy aimed at containing Moscow, as well as news that flights from Russia to Egypt may resume by New Year. Over the past several days, no new official statements with findings regarding the causes of the Russian plane crash on Egypt’s Sinai Peninsula on Oct. 31 have been made, reports the liberal Novaya Gazeta newspaper. However, on Nov. 8, an Egyptian official told the ABC channel that the Russian aircraft was most likely brought down by a terrorist attack. Aircraft design engineer Mark Solonin, who has analyzed one of the pictures made at the crash site, agrees that an explosion on board the aircraft is the likeliest cause of the crash, writes Novaya Gazeta. Densely located small-diameter holes on the internal surface of a door in the rear of the aircraft look similar to holes that could have been left by the fragmentation of an explosive device, like bearing balls, said Solonin. "The fact that the holes are located so close to each other may mean that the source of fragmentation was situated in immediate proximity to that door,” he said. Russian experts say that chemical tests should help establish what it was that exploded on board the aircraft. The Russian government will hold a special session on Nov. 10 to discuss ways of supporting the country’s tourist sector, reports the centrist daily Nezavisimaya Gazeta. One problem area is the situation with tourists who have already paid for a holiday in Egypt and now want to get their money back. The executive director of the Russian association of tourist operators, Maya Lomidze, says that tour operators cannot return all the money: "They do not have new sales." "In addition, it is important to understand that the aircraft that are now flying to Egypt to pick up Russian tourists from there are going there empty. Which means that half of the journey will have to be paid for by tour operators themselves." Insurance companies too have declared that the Russian government's decision to suspend flights to Egypt does not constitute an insurance event and therefore does not envisage compensation payments. The first vice-president of the Center of Political Technologies, Alexei Makarkin, predicts that the resumption of flights will depend on a radical improvement of the security situation at Egypt's main airports. "The Egyptian side should demonstrate and confirm to international experts that it has taken sufficient security measures and that these measures are not just limited to sacking several officials and that they are in line with global standards. If all this has been done, flights can be resumed. If the Egyptian side manages to do this quickly, then flights will be resumed soon," said Makarkin. According to his estimates, this may happen before the New Year and Christmas holidays. The Obama administration views Russia as the main threat to international security, reports the Kommersant business daily. The Pentagon’s plans of how to counter Russia were outlined by the department’s head Ashton Carter at a conference in Simi Valley, California, writes the publication. “In Europe, Russia has been violating sovereignty in Ukraine and Georgia and actively trying to intimidate the Baltic states. Meanwhile, in Syria, it is throwing gasoline on an already dangerous fire, prolonging a civil war that fuels the very extremism Russia claims to oppose," the Pentagon chief said, listing Washington’s accusations against Moscow. According to him, America “does not seek a cold, let alone a hot, war with Russia and does not seek to make Russia an enemy.” “But make no mistake; the United States will defend our interests, our allies, the principled international order,” the U.S. defense secretary added. The United States’ response should consist in “reformatting” its military potential in Europe. “We are updating and advancing our operational plans for deterrence and defense given Russia’s changed behavior,” said Carter. However, sources in the Russian state structures view this not as a new U.S. policy but rather as the White House's desire to avoid accusations of excessive leniency following a certain rapprochement between Russia and the U.S. over Syria. "After a positive interaction there usually follow some tough statements from the Pentagon or the State Department. Thus the Obama administration is trying to balance its Russia policy and avoid accusations of excessive leniency towards Moscow," the paper quotes one of its sources as saying.